Thank you for comming. More photos can be seen here. 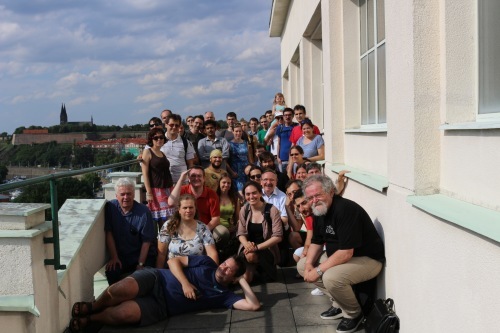 The workshop continues the tradition of Prague Combinatorial Workshops held since 1993. 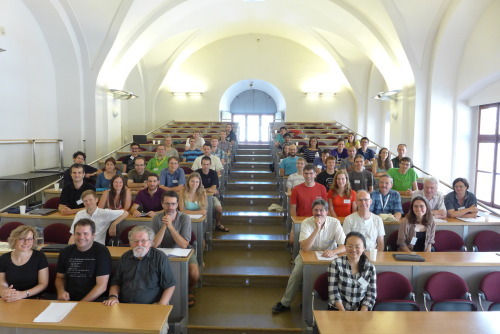 Oriented on problems of all fields of graph theory, combinatorics and discrete geometry, it will continue in the spirit and informal working atmosphere of the previous meetings. 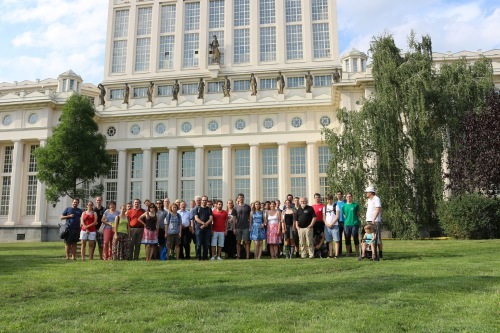 The workshop takes place at DIMATIA and the Department of Applied Mathematics of Charles University, Malostranske namesti 25, Prague 1, which is located in a historic building in the center of Old Prague. The workshop is also supported by Computer Science Institute of Charles University. The workshop participation is by invitation only. Regardless, if you wish to participate, please email the organizers and we will respond to you shortly. In case you need an invitation letter (for example for your visa), please let us know and we will be happy to write one for you. Coffee breaks and part of the meals are provided by the organizers. However, we will collect a modest fee of EUR 70 towards a fraction of the expenses. As is the tradition, the program of the workshop is determined from day to day. The afternoons are reserved for discussions and other activities. If you intend to give a talk during the MCW, please let us know a few days in advance. 9:30 Registration + welcome coffee. 10:00 at Lecture Room S5: Workshop starts. Dinner at boat. Departure from Rašínovo nábřeží. If you arrive later during the workshop, please register with the secretaries in the room 222 (at the 2nd floor). On Wednesday afternoon, there will be an awesome social event. Two open lounges with tables, chairs and a whiteboard opposite the Lecture Room S5. You can take the lounges on a first come, first serve basis. Great for working on open problems in the afternoon! Two open lounges with tables, chairs and a whiteboard on the third floor, directly above the lounges on the second floor. Same rules apply. Water coolers in the hall with the open lounges -- both on second and third floor. If you need anything else, contact the organizers. For the public transportation you can buy a 90-minute ticket for 32 CZK or 30-minute for 24 CZK in a newsstand or in a vending machine. The vending machines only accept coins (no credit cards, no paper money). The ticket needs to be validated (in a magic yellow validating machine with a shining arrow). The validating machines are located inside buses and trams. In the Metro subway system, the machine is located at the entryway to the station. If you need to find a tram connection, you can use the official website. The department building is located near the tram stop "Malostranske namesti". You can see it from the tram stop. It is this building. Take bus number 119 to Nádraží Veleslavín station (last stop). Transfer to Metro subway A (green line) and take it to the station Namesti Miru. Take the tram 22 (direction: Kubanske namesti) for one stop to the tram stop Jana Masaryka (location here), and walk to the hotel (hotel location here) from that stop. Alternately: for a faster but slightly longer walk, you can walk from the station Namesti Miru as follows: Take the Americka street and when you reach the intersection with Machova street, your hotel is nearby (hotel location here). Take the tram 22 (direction: Kralovka) to the stop Malostranske namesti. From airport to Karolinum take bus number 119 to Nádraží Veleslavín station (last stop). Transfer to Metro subway A (green line) and take it to the station Staromestska. Take the Kaprova street to the Old Town Square. From the Old Town Square go through the Celetna street to your hotel. Walk to the Subway station Staromestska. Take the Metro subway line A (direction: Nemocnice Motol) to Malostranska. Exit the subway at Malostranska and take one stop with any of the following trams: 12, 20 or 22 to Malostranske namesti. All e-mail correspondence concerning the workshop (e.g. 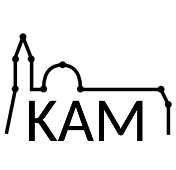 registration, accommodation) should be directed to mcw@kam.mff.cuni.cz.